Jio Diwali 100% Cashback Offer On Rs 399 Recharge - How To Get in Jio Diwali Dhan Dhana Dhan? 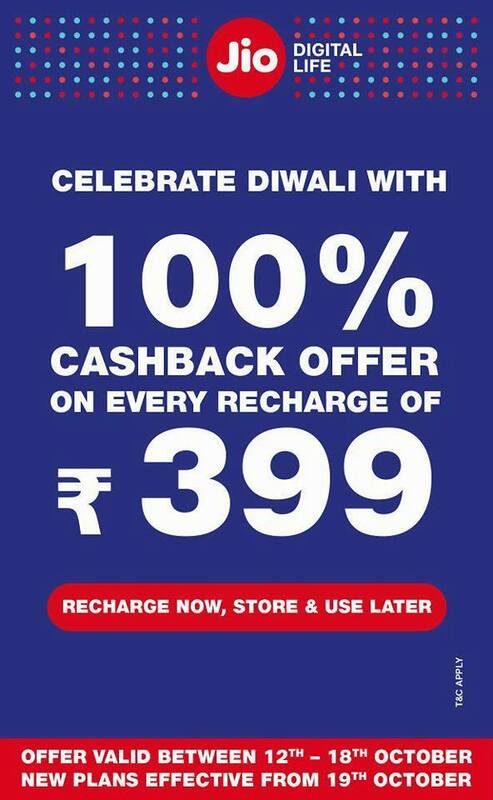 Jio Diwali 100% Cashback Offer On Rs 399 Recharge – How To Get in Jio Diwali Dhan Dhana Dhan? Jio announces the bonanza Diwali offer for its clients. Jio is now offering 100% cashback on recharge of Rs 399. Jio’s 100% cashback offer will be in terms of vouchers, they can be further used for mobile recharges. All the Reliance Jio prepaid users can avail this opportunity from 12th October to 18th October. Check more details of Rs 399 cash back offer such as free data, validity period, how to activate, where to recharge and other complete details from this article. 1.1 Reliance Jio Diwali Dhan Dhana Dhan Offer – How to Activate/ Recharge? jio 100% Cashback Offer : The Jio Diwali Dhan Dhana Dhan Offer can be availed between 12th October to 18th October. Under this offer, the users will get 84 GB of 1GB Data per day, free voice calls, free SMS for a period of 84 days. Reliance Jio prepaid users can utilize this offer by paying Rs 399 and postpaid users can also utilize this offer with same benefits until 3 billing cycles. The users recharging with Rs 399 can get 8 vouchers of Rs 50 (a total of Rs 400). Users can make the further recharges using these vouchers. Also, these vouchers can be redeemed for Rs 309 recharge and above plans. Also for Rs 91 data and other plans. For instance, if the users are going to activate the Rs 309 plan on their mobiles they can use one voucher of Rs 50 and the remaining amount can be paid through debit/credit cards, net banking options. The customers can redeem only one voucher at a time. The last date to redeem the Jio vouchers is 15th November. The Jio Diwali offer can be used by the users who are having the validity for next few days. Once if Rs 399 pack is recharged, the pack will get activated after the present offer completes. So, users presently having the validity period can also avail this offer. Reliance Jio Diwali Dhan Dhana Dhan Offer – How to Activate/ Recharge? Online platforms such as PayTm, JioMoney, Amazon Pay, Mobikwik etc. I didnot recieveed my vouchers so far even though i recharged on 18th october . I recharged with 399 Diwali offer..
but i didn’t get vouchers..
Can I use a voucher to rechare of 51 data booster pack? No u can use the voucher for Rs 91 or more data plans and u can use the coupon only for recharging your Jio number. I have received 8 vouchers bt how i can use i didn’t get plz tell me how i can use that vouchers.. This voucher can only be used by jioapp to recharge automatically company. It shows the purchaser problem. Hence recharge phone with out creating problem to the Clint’s. Go to- My jio app.. Using Ur dbt card or creadit card. – Remember One Thing .You can use only one ‘voucher’ At a time for Ur Recharge. you can use voucher after 20th november 2017 only. how 8 vouchers use for rechare my jio, 8 vouchers held, but buy column press in jio app asking my bank card atm, then what about my vouchers as taken on rechare 399 plan in month of oct. today is last date as shown in my vouchers histry. Iv received eight vouchers of rs 50 …..bt hv no idea how to use it plz help…..
Tell me why would I recharge my phone before january (84 days) to get those 50 bucks voucher cashed in … Aren’t you making fool of us? You Will not recieve Vouchers physically it will Credit to your Account You can check it from MyJio App.The People Who have recharged But not activated your plan till now go to Myjio App and there u can activate your Current plan. Can we gift the voucher to other Jio users?? I still didn’t receive the vouchers after recharging with 399 plan. The voucher section on my jio app remains blank. How to use voucher to recharge another number of rupees 399? I recharged for 399rs but received only vouchers. Still my calls and messgaes are’t going. Its showing no plans activated yet. What do i need to do? I didn’t received the vouchers after recharge yet. What should I have to do? 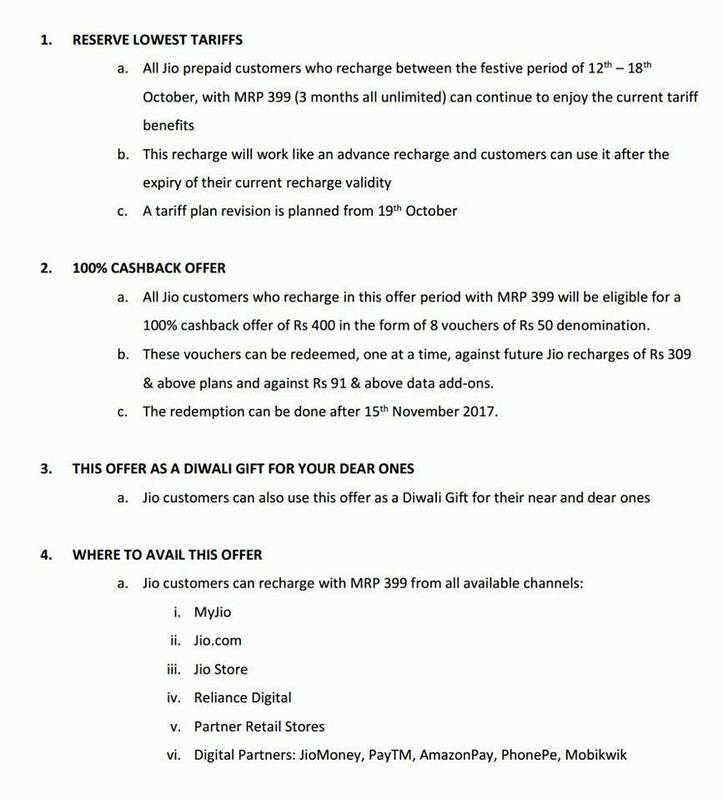 Those vouchers can be used one at a time, after November 15, against future recharges of Rs 309 and above plans and data add-ons of Rs 91 and above. what is the validity of vouchers ? last date?